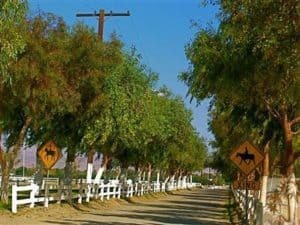 La Quinta Polo Estates, is directly across from the Polo Fields!! 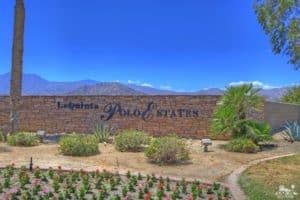 The La Quinta Polo Estates is on Madison St. with the entry to this gorgeous custom home lot right across from the Eldorado Polo Club. That means a great location if you’re looking for a home that can also produce Lease income! Minimum 30 day rentals allowed, the community is gated, and lots are approx. 2 acres each. Zoned for up to 2 horses/acre, but mostly these are large custom homes on very large lots. There are still several build able parcels for sale, amongst the gorgeous custom homes priced from 1.8 mil to approx. 4 mil. HOA is approx. $350/month, minimum footprint of 4,500 sf allowed. Another option is the centrally located Flores Montanas near Old Town La Quinta. Another gated community consisting of only 19 lots, there are still some build able lots for sale. The location near the LQ Spa & Hotel, Old Town, and the hiking trails in the Cove, make this community special. HOA is only $225/month. Minimum footprint here is 2500 sf of living space. The parcel for sale here is Lot #8, which is an interior parcel priced at just $259,000. Take the walking tour of this build able lot in Flores Montanas by clicking the link.